Easy safe moving of Spinets, Grands, Baby Grands, Consoles & Uprights. The Professional way to move and protect ALL pianos. Hardwood sills on street rail form strong plaltform truss. 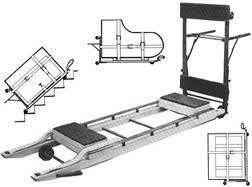 * Please call us with any questions about our buckeye inch 40 inch pianotruck rentals in the cities of Redwood City, Menlo Park, Palo Alto, San Mateo, San Francisco, Santa Clara and more.